She specializes in Foods, Nutrition and Diet Therapy. Her areas of research interest are Maternal Nutrition, Energy balance studies, evaluation of Nutrition Programmes, Adolescent nutrition and human metabolic studies. 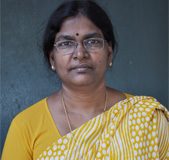 Some of the important studies in which she has been involved include (1) Effect of hormonal contraceptives on breast fed infants – WHO study (2) Effect of maternal nutrition on low birth weight – USAID study (3) Energy cost of pregnancy in rural Indian women – Doctoral work (4) Human metabolic studies on health effects of coconut oils. She also participated in a evaluation studies on a mid-day meal programmes for school going children to encourage enrolment, attendance and to improve Nutritional Status. Conducted a study on reaching under threes through ICDS and collected baseline information of APER (Andhra Pradesh Economic Reconstruction) ICDS areas in Andhra Pradesh. Surveyed drought affected areas in Andhra Pradesh to assess the impact of drought on nutritional status of the population. Developed recipes with dried GLV and tested the acceptability among pre-school children to improve their Vitamin-A nutritional status. Was involved in the development of Nutrition Surveillance System in Andhra Pradesh, revision of Dietary Guidelines for Indians. Dr. Damayanti serves as faculty member for regular and adhoc training programmes at the institute including M.Sc. (Applied Nutrition), Course and Orientation and training programmes for Food and Nutrition conducted at National Institute of Nutrition. She has also been managing the diet Counseling Center established at NIN in September 2006 and has been regularly counseling the people on prior appointment. Hemalatha R; Annapurna VV; Damayanti K; Radhakrishna KV : Substantial proportion of apparently healthy, urban south Indian young adults has insulin resistance associated with other cardiovascular risk factors. J Med Sci. 3 :110-117, 2010. Damayanti K; Radhika M: Methodology for food intake assessment. In “Concepts and skills for practical dietetics“, Ed. By Dr. K. Bhaskarachary; Dr. V. Sudershan Rao and Dr. G.M.Subba Rao, Indian Dietetic Association, Andhra Pradesh Chapter, Hyderabad, 2010, 48-57 pp. Review article on “Combating vitamin A Deficiency” In Touch a newsletter brought out by Heinz Nutrition Foundation India. Vol 8 Num 2 July-Sept 2006. Report on “Development of Nutrition Surveillance System in Andhra Pradesh: “D. Hanumantha Rao, K.Vijayaraghavan, K.V.R. Sarma, G.N.V. Brahmam, K. Mallikarjuna Rao, K.Damayanti , 1998. Rameshwar Shrama, K.V., M.V.V. Rao, K.Damayanti and M.Ravindranath: “Prediction of birth weight from birth weight of new borns” Indian Pediatrics 34, 1997, 402-5. Damayanti K : Dietary guidelines for Indians. In “ XIX APSI Scientist meet 2010 and U.G.C. Sponsored National Conference on Plant Biotechnology :Towards nutrition & nutraceutical potential “, 30th September – 1st October 2010,Organised by Department of Botany, Sarojini Naidu Vanita Maha Vidyalaya, Hyderabad, 2010, 11p. Attended conference on “New Approaches to Infant and Young Child Feeding and Development” Indo-US conference organized at NIN supported by Indo-US science and Technology Forum on 9th April 2009. Attended National conference of Nutrition Society of India organized at NIN 19th -21st November, 2009. Attended a Symposium on “Frontiers of Nutrition Extension and Communication” on 27th March 2006 conducted at NIN, Hyderabad by NIN and Indian Dietetic Association. Participated in a workshop on “Promoting Family Nutrition through Mahila Panches and Sarpanches from 7th –9th February 2006 at National Institute of Public Cooperation and Child Development, New Delhi. Attended a workshop on “Dietary Fats and Non-Communicable diseases” from 7th to 8th July 2005, at NIN, Hyderabad. Participated in a WHO-FAO Inter country workshop for Updating and Implementing Inter-Sectoral Food and Nutrition Plans and Policies from 4th April to 8th 2005 at NIN, Hyderabad. Participated in the ICMR-WHO Workshop on Intellectual Property Rights and WTO Issues held at the Regional Medical Research Centre for Tribals, Jabalpur, on February 16-17, 2004. Presented a paper on “Nutritional status of late childhood in the tribal areas of Madhya Pradesh” as a resource person in a National Seminar on “Childhood Nutrition – To extend the life expectancy” on 9th &10th December, 2003 at Govt. M.H.College of Home science & Science for Women (Autonomous), Jabalpur, Madhya Pradesh. Presented a paper on “Nutritional status of the Adolescents in the tribal area of Madhya Pradesh” in XXXV Annual conference of the Nutritional Society for India, on 12-13th December 2003 at Hyderabad and received a merit certificate for the same. A paper on “Changes in BMR during pregnancy in rural Indian women” was presented in “IX Asian Congress of Nutrition”, New Delhi, 23-27th Feb 2003. A article titled ” 3 Vs 6 Meals” published in english daily news paper “Times of India” on 2nd February, 2010. An article on diet during examinations titled “Parikshalu.. Parikshalu “.about nutrition was published in Health section of “Andhra Jyothi” telugu daily news paper in Telugu on 3rd February, 2010. An article on Fast food titled” Fast foodtho fat muppu “published in the health section of Telugu daily news paper “Sakkshi” in 1st March 2010. An article on alternative pulses in place of red gram dal titled “Vanda Pappula Kanna Chouka Pappule Minna” Published in “EENADU” telugu daily news paper on 12th August, 2009.